The choice between speed and capacity is over. Choose both. Traditionally, SSDs have offered powerful speeds and extra features, but at a high cost per gigabyte. 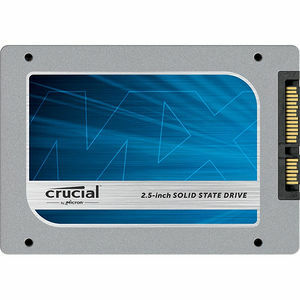 Enter the Crucial MX100 SSD. Leveraging years of R&D and the latest NAND technology, the Crucial MX100 offers a low cost per GB, combined with unrelenting performance and one of the most complete feature sets available. As a brand of Micron, one of the largest flash storage manufacturers in the world, the Crucial MX100 is backed by the same quality and innovation that has produced some of the world's most advanced memory and storage technologies. With over a thousand hours of prerelease validation testing and hundreds of SSD qualification tests, the Crucial MX100 has been thoroughly tried, tested, and proven. Make the switch to the Crucial MX100 SSD and start outlasting and outperforming your hard drive.